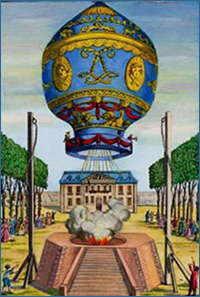 The first recorded instance of hot-air balloon capable of carrying humans was built by the brothers Josef and Etienne Montgolfier in Annonay, France in 1783. These two brothers were paper manufacturers who had seen the ash rising in the plant furnaces. After many experiments they decided to build a balloon large enough to carry some passengers, and on September 19th, 1783 the brothers successfully launched a balloon made from paper and cloth. The passengers onboard were: a sheep, rooster and a duck. Stoked by a fire on the ground the balloon climbed to a height of 6,000 feet and traveled more than one mile. Impassioned by their success the brothers decided that they had shown humans would be safe to fly. It was decided for this first, dangerous, flight they would send two convicts as passengers, but when the King heard their plans he decided the occasion was too momentous to have only nameless convects as passengers. So, on the 21st of November, 1783. Pilatre de Rozier, a young physicist, and the Marquis Francois d'Arlandes, a nobleman, became the first recorded humans to fly. These first hot air balloons were cloth and paper inflated by a fire built on the ground or a grill attached to the bottom, giving them the appearance of spewing smoke and flames. When passengers landed in farmers fields the farmers would think that the balloon was a dragon, and would run into the fields to stab the monster to death. Since it was expensive to build these balloons the early pilots came up with an ingenues solution; and began to carry Champaign with them. When they would land they would then share the beverage with the locals as a peace offering, saving their balloon and making new friends. This tradition even survives to modern times and many balloon crews celebrate a passengers first flight with champagne or sparkling grape juice. Modern hot-air ballooning began in October of 1960 when the first hot air balloon flight with a controlled heat source took place. Until that time safe and altitude controlled balloons had been limited to gas, which was hard to find and expensive, since the practice of flying Montgolfier-style balloons was dangerous and unpredictable. The pilot and chief engineer on this historic occasion was a man named Ed Yost. For many years Ed had been building weather balloons for several companies and had recently began working for a young company called Raven Industries. Today Raven industries is a large manufacturer of aeronautical products; and until recently, one of it's divisions - Aerostar - was the worlds largest, and best known producer of hot-air balloons. Unfortunately Aerostar ended production of hot-air balloons during 2007. Hot-air ballooning has undergone a renaissance since those early flights in 1960 by Ed Yost, and modern balloons are safe, functional FAA certified aircraft. There are about 5,000 pilots in the U.S. alone, and the sport of ballooning has become a enthusiast hobby for many around the world. There are many festivals and events involving hundreds of hot air balloons from across the country. Alabama, Tennessee, Georgia, and Mississippi are popular places for hot-air ballooning, so many local people are not surprised to see one in the air. 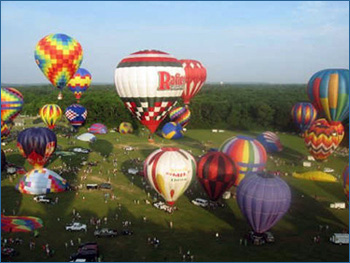 There are several balloon events in Alabama each year, visit our events page for maps and information about these festivals and others around the southeast. 1793First flight of a hot air balloon in the USA. 1861The first military balloon of the Civil War is flown by Thaddeus S. C. Lowe. See More. 1874Zeppelins are first designed by Count Ferdinand von Zeppelin. 1978 The Alabama Jubilee Hot-Air Balloon Classic is founded.